With the passage of tax reform, one market segment one might believe experiences an outsized benefit to earnings is U.S small cap stocks. This certainly seems plausible due to the fact smaller companies tend to have less direct exposure to foreign revenue; therefore, likely generating most of their profits in the U.S.
Our firm exited completely the U.S. small cap space in late 2013 based on a number of factors, with one being the relative valuation of small cap stocks versus large cap stocks. Reviewing the relative valuation of small caps versus large caps based on price earnings ratios has certainly turned to favor small over large as can be seen in the chart below. "the average mutual fund investor lags a buy-and-hold strategy by -1.9%. This finding is persistent across different styles, varying from -1.3% for value investors to -3.2% for growth investors. Also 'passive' investors in market funds underperform a buy-and-hold strategy by a whopping -2.7%." "Keeping perspective, as repeatedly noted, while 1000 point declines make for frightening headlines, the percentage changes represented by those moves are not uncommon. To wit, there have been nearly 300 daily 4% or greater moves since the DJIA’s inception. Put another way, 3 of the top 10 worst point drops on record occurred during this recent spell; none of them, however, come anywhere near the worst percentage." I have often written that sentiment measures are most valuable at their extremes. Also, they tend to be most representative of potential market turning points when the extreme is at the bearish end of the spectrum. However, in hindsight, it appears recent excessive bullishness for individual investors and institutional investors indicated a cautionary equity market outlook would have been profitable. The first chart below represents individual investors' bullish sentiment responses as reported weekly by The American Association of Individual Investors. On January 4 of this year bullish sentiment spiked to near 60% and represents a high level for this reading. About a month later, the 8-period moving average reached near 51%, also a high level for the 8-period average, although the average has exceed 60% in the past. Unwelcome, Unpleasant, Inevitable. 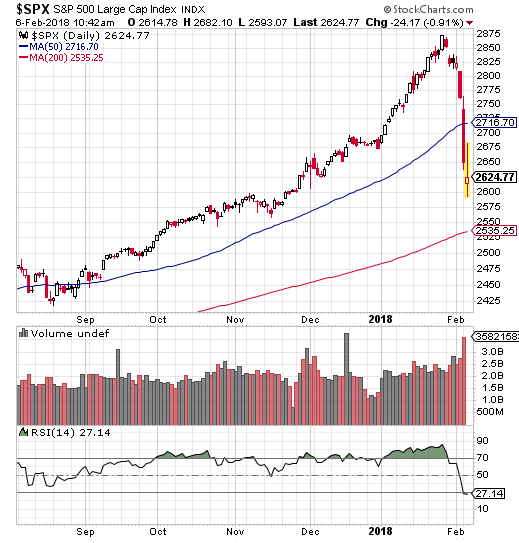 The recent spike in volatility has certainly caught the attention of investors over the past several days and as corrections go, the market drop has been quick and sharp.